This recipe is based off of a recipe given to me by my sister’s neighbor, John. His version is a Chicken Curry and it’s fabulous! I begged for the recipe after eating it at my sister’s house. He was kind enough to give it to me with a bottle of the curry that he likes to use. The flavors are so great, I knew it had to be good with vegetables too…and it is! I may have mentioned this before, but if you think you don’t like curry, please try this! My husband has always said that he doesn’t like curry and this is now one of his favorites! The curry seems to be balanced by the coconut milk in this recipe and I think that may be why he likes it so much. You can certainly use any vegetables you want. The ones I’ve listed in the recipe are just some that I had in the fridge, but make it your own and add your favorites. This curry is so simple. The hardest part may be chopping up the vegetables. Just put on some great music, maybe pour a glass of wine and it’ll be fun! 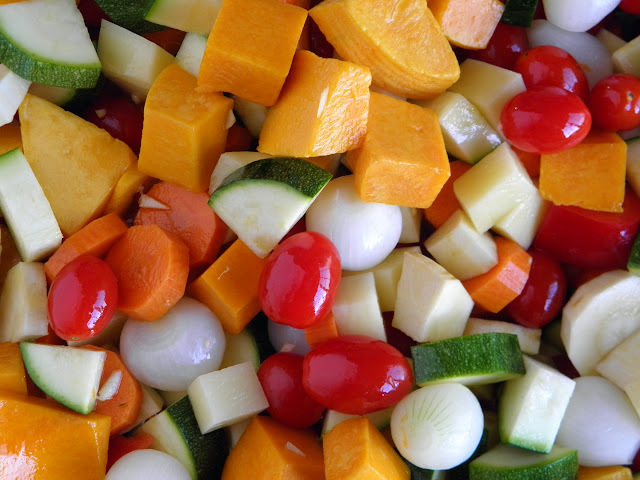 After chopping all of your veggies, put them into your largest baking dish. The more room you have to toss them around the better. Speaking of tossing…toss them with 3 tablespoons of the olive oil then put them into the oven and give them a few more tosses every so often. Now, this part is tricky. After about 30 to 35 minutes, start testing the different veggies by poking with a fork. You want them to be almost done, but not all the way done since you’ll cook them on the stove for just a little more. If they are not almost done, you may need up to 5 minutes more. In a large pot over medium high heat, sauté the chopped onion with the remaining olive oil for about 3 or 4 minutes. Add the roasted vegetables. Be careful, they are hot, just use a large spoon to transfer them. Add the curry, coconut milk, vegetable broth, raisins and peas. Bring the pot to a low simmer and continue to cook for about 5 minutes or until all of the veggies are soft but not mushy. Try to keep all of your vegetables uniform in size so they cook up about the same time. Don’t make yourself nuts trying to peel those pearl onions! Just drop them into a small pot of boiling water for 3 minutes, drain and refill the pot with cold water, then just cut off the root end and they’ll peel super easy! I like to serve the curry with either brown basmati rice or warmed naan, an Indian flatbread. When reheating the curry the following day, you can add some vegetable or chicken stock to thin it out a bit. I use Blue Mountain Country Hot Jamaican Curry. It comes in hot and mild. how many ppl does this recipe feed? This serves about six, Sara. Hope you like it!